If you are on the store you can just tap on top of an item and it will get crossed out. 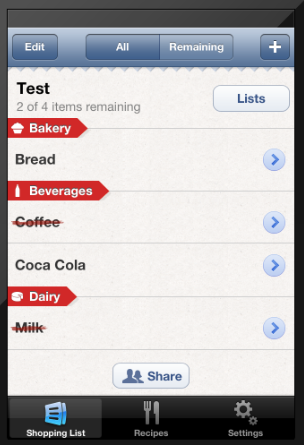 You can also use the filter tabs by showing all the items of a list or just the remaining ones which makes it even more confortable. 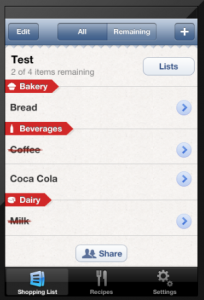 As an addon the App has a Recipies tab where you can get a lot of nice ideas to cook. The App is free to download, it doesnt has any Ads (for now) and has already been downloaded by more than 60.000 users in just a few months of being released. For an App like this, I wouldnt mind paying a couple of bucks. Jeff Hunter and Jason Marr, the founders are two former Apple employees and decided to start their own business with AnyList as a great starting point. I hope we can see a lot of new developments from them soon.